The Hunt Camp. It looks pretty much the same today. Built by 1920. The early history of Hawk Lake is shrouded in the mystery of time. Legend has it the indigenous peoples had a silver mine near the lake. An early trapper befriended an old man who told him about the location of the mine. It was located on a hill overlooking the Lake between two large pine trees. That’s like describing Haliburton County; way too vague! By the time searchers arrived, the pine trees were long gone. The legend is just that: still a legend. The next recorded chapter was the era of the lumberman. They chased the massive white pines that proliferated throughout the area. The lumbermen could not penetrate the area until roads were built. While they did use the waterways to float the logs south to market, the supplies needed to run a lumber shanty had to be cadged in by road. The “roads” were very primitive by today’s standards; mostly trails fit only to be used in the early winter when the ground was frozen, but the snow was not too deep. One of these cadge roads was recorded leading to Hall’s Lake from the west. The lumbermen would build temporary shanties in the vicinity and drive their logs south on the spring flood. They needed a reliable water supply so they built the dam where the Hawk River starts it precipitous plunge towards Hall’s Lake. The logs would also be gathered from Crab and Trout Lakes and driven on this watershed. The Hawk River is shallow, so the drivers would wait until the logs collected above the dam, release a torrent of water and push the logs down to Hall’s Lake, on to Boshkung and down the Gull River system to places like Fenelon Falls, Bobcaygeon or Peterborough to the saw mills. Once the pine were stripped from this watershed, the dams, log chutes and shanties were all abandoned and left to rot. One family member (Uncle Dunc), a river driver from the Age of the Lumber Barons (1860-1890), told the story about grave sites along the river systems. Most drivers couldn’t swim a lick, so your first good dunking could be your last. Bodies couldn’t be “brought out” to the nearest cemetery; you were simply buried on the spot. 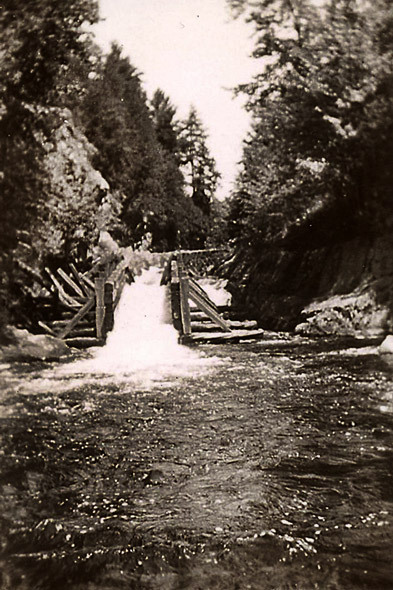 The Hawk River Chute was the most dangerous spot in Haliburton County for river drivers. Uncle Dunc said there were 13 graves in the burial ground at the Chute. I guess they are still there… somewhere. “A Kin Shooting.” Sportsmen at play circa 1880. A shooting match between Kinmount Rifle Club and Minden Rifle Club. James (Uncle Jim) Scott is bottom row, fourth from the right. 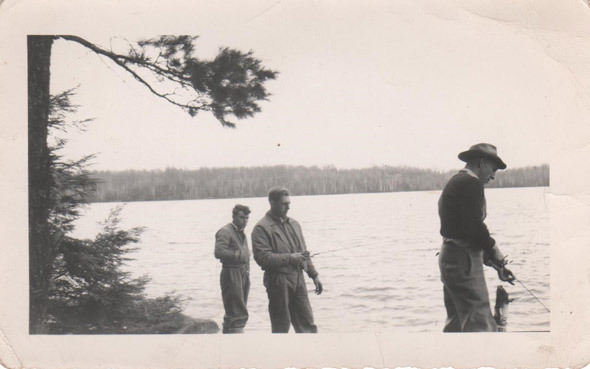 Later he established Scott’s Point as his fishing/hunting camp. Kinmount won the match! A fish string from the 1920s. 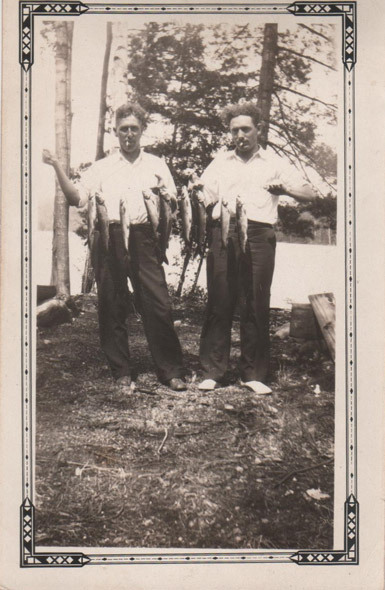 About 1900, the Scott Family from Kinmount travelled to Hawk Lake to fish and hunt. James Scott ran a hotel in Kinmount and considered himself a “sportsman”. How he picked Hawk Lake, I don’t know. 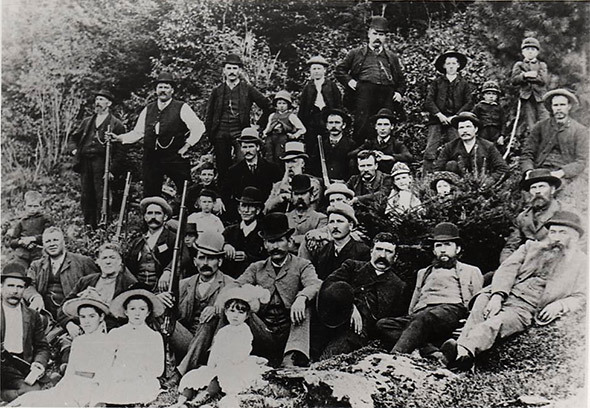 Lots of Kinmount men were shanty boys and river drivers and no doubt over a tankard of ale, one boasted about the game found up north. I believe the first visits would have been fishing expeditions. Deer were plentiful all over the area, and Uncle Jim as he was called by the Scott family, could get his fill of big game closer to home. But those big lake trout; that was another story! 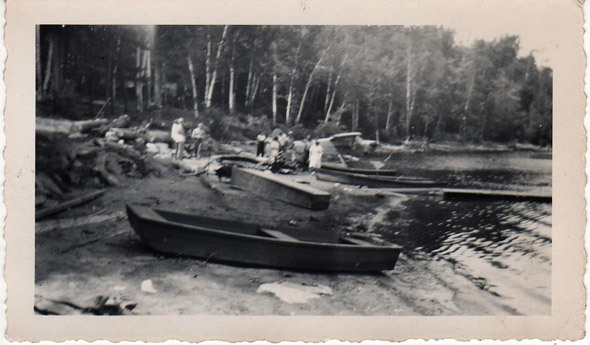 The old post card we have refers to the first camp as a fishing camp. Getting to Hawk Lake was a challenge. As previously said, Highway #35 did not exist. The Scott party travelled to Boshkung to the Welch Farm near Buttermilk Falls. 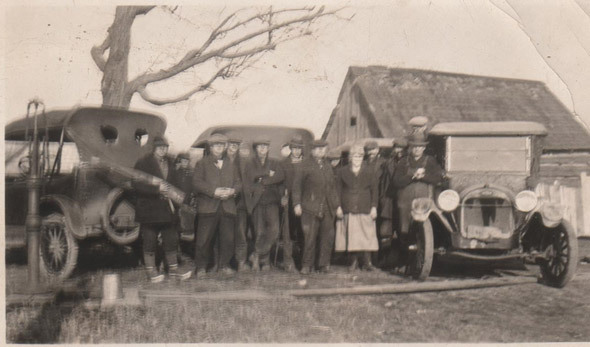 The old photo shows a line-up of Model T’s at the Welch farm bound for Hawk Lake. The Welches were early settlers in the area. How the two families knew one another is speculation, but the two Welch boys were in the same WW I battalion (109th) as my grandfather. They were both killed overseas and their story is told in the Stanhope Museum. They may have staged the expedition from Welchs or they may have inched closer along the west side of Hall’s Lake via some cadge road, but their destination was Saskatchewan Lake north of Hall’s Lake. Here they launched their canoes and paddled through the Three Sisters Lakes et al, out into the Mud River and hence to Big Hawk Lake. 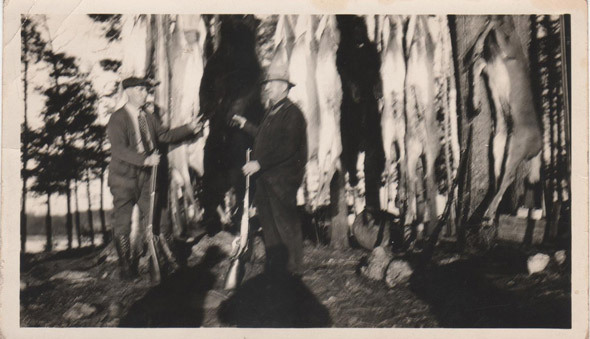 1937 hunt. The gang members pose with their rack. The Camp was also used in deer hunting season by Uncle Jim’s gang. Photos marked 1937 feature the kills of the week. Scott’s Point was ideally situated on Big Hawk Narrows for deer to cross. Sometimes they still do! But everything was boat related and the early hunters had to be expert boatmen. Where they hunted was not recorded, but the results sure were! 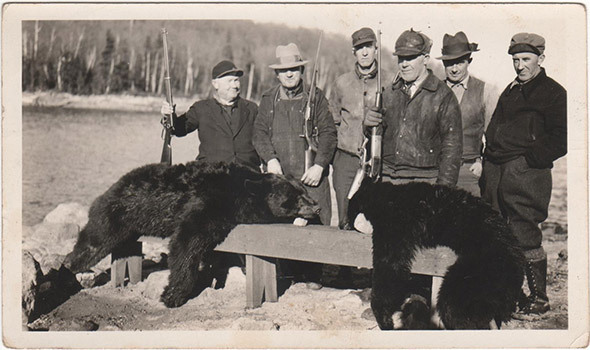 The 1937 hunt gang pose with a pair of black bears. Uncle Jim Scott is at left. The water levels were low back then. Hunting season was in November. Uncle Jim squatted (that means built illegally) on the prime piece of land now called Scott’s Point. He had his choice because there was nobody else on the lake! All materials had to be floated via Saskatchewan Lake because it was impossible to canoe up the Hawk River and there were no real roads. It was all crown land at the time, and people simply squatted wherever they felt like it. Only in the 1960s did the family purchase their point! Uncle Jim died in the 1930s, and lacking any sons, willed the property to my grandfather, Wally Scott. 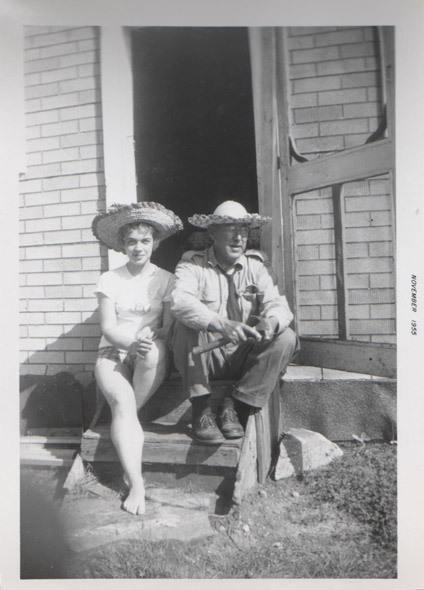 Wally Scott on front step with unknown companion (1950s) Wally is dressed in his Game Warden uniform. As soon as the ice went out in May, you could catch lake trout off shore with a casting rod. The ice was out by May 24. Catches of 15-20 were common. After this date, trolling by boat was used. The narrows in front of Scott’s Point was a hotspot. OOPPSS! I spilled a fishing secret! Forgive me Uncle Ralph! 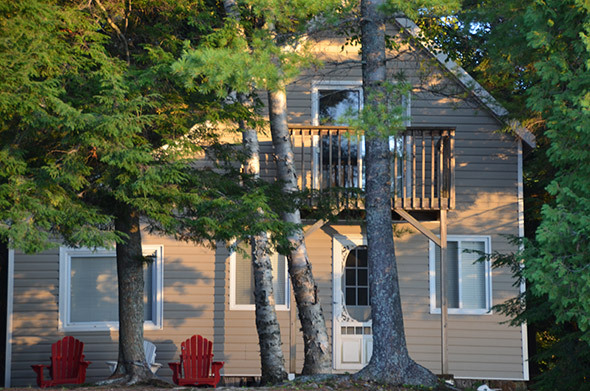 The current “cottage” at Scott’s Point (we call it the Camp: short for hunt camp) was built sometime before 1930. The wall was lined with calendars from Kinmount businesses of the 1920s. 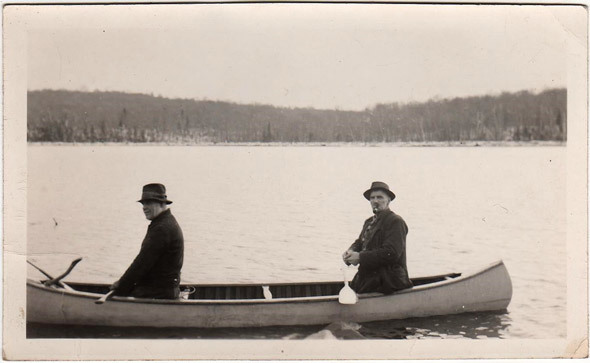 Sometime before 1940, the first business was started: Oakview Lodge on Little Hawk Lake. A road was built to open up Little Hawk, and any cottagers (including the denizens at Scott’s Point) could launch their boats at Little Hawk Marina. Before the Big Hawk Road was opened, we used Little Hawk. I remember being the “bow-man” who watched for stumps while travelling through the narrows between the two lakes in low water. After Big Hawk Marina was built, we changed our loyalty. Pete Sawyer was the businessman back in the 1950s and 1960s. There was no electricity, so Pete had a huge ice house. 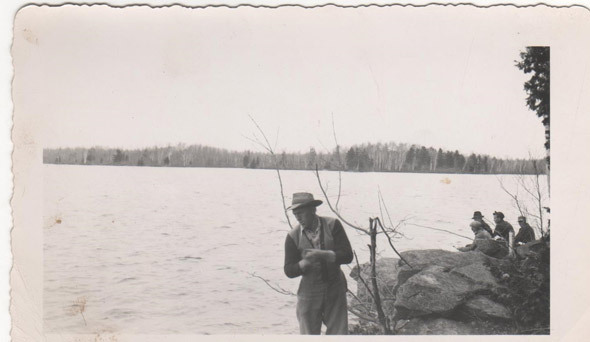 He delivered blocks of ice by boat to cottagers, coming around twice a week. He also carried milk, bread and a few other grocery items in his big, flat bottomed boat. It was exciting to hear the boat motor slow down and shut off as Pete the Ice Man arrived. Company we called it. A bit of gossip, a block of ice and off to the next stop. 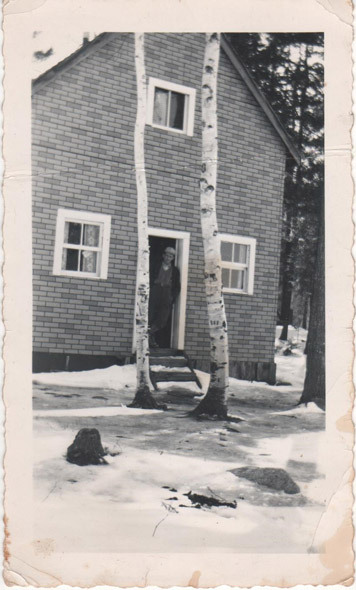 Pete also shoveled snow off cottage roofs in the winter and generally kept an eye on the few cottages on the lakes. 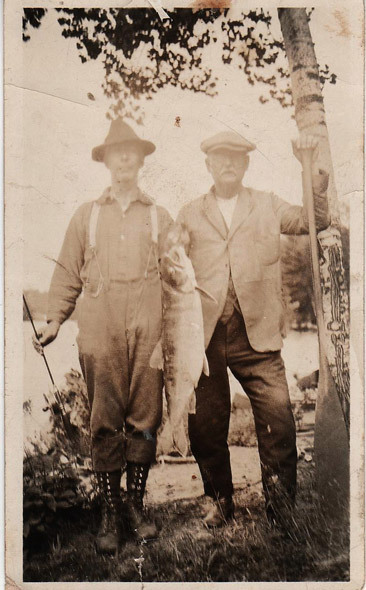 My grandfather was a local game warden (now called “Conservation Officers”) so he and Pete were on a first name basis. 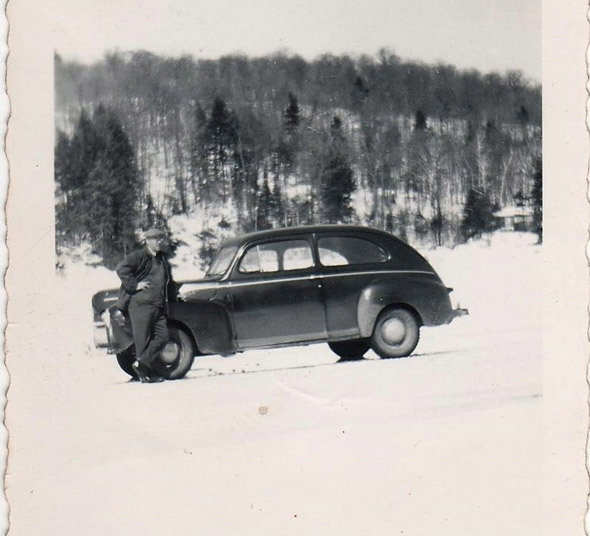 On at least one occasion, my grandfather actually “drove” to the cottage (see the car at Scott’s Point photo). After the War (WW II), the entire area was opened up for cottaging. The Big Hawk Road was pushed through to the foot of Big Hawk Lake and the lake began to fill up. But that’s another story. This story is written by Guy Scott, brother of Laurie Scott, the five time elected MPP for Haliburton-Kawartha Lakes-Brock and present Minister of Labour. HHLPOA would like to thank her for passing on the request for a story to her brother who is the family historian. Guy Scott has authored or co-authored five books to date, including “History of Kinmount” and “County Fairs in Canada”. In 2017 Mr. Scott was named “Kinmount Citizen of the Year” by the Kinmount Lions Club for his volunteerism which included being director of the Kinmount Fair. Guy is also a secondary school history teacher.